Portsmouth running back Tyler McCoy fights for extra yardage against the Senators defense. West senior quarterback Dylan Bradford lead his team to victory Friday night at Trojan Coliseum, 13-0. 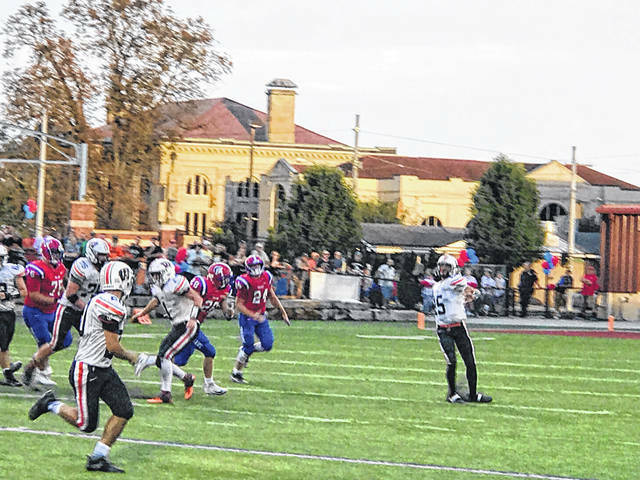 The Portsmouth West Senators picked up their second straight road victory Friday night, this time over the Portsmouth Trojans at Trojan Coliseum by a final score of 13-0. The game was very back and forth to start the first half. The Senators marched down the field in their opening drive on a Trojans defense that gave up 33 offensive points to Valley a week ago. However, the Trojans were able to get a crucial stop on a 4th and two rush by Garrett Hurd that came up short. The Trojans could never get anything going offensively Friday night, a credit to the Senators defense according to Trojans head coach Bruce Kalb. “When you have an opponent that you’re just as good as and they’re just as good as you” said Kalb, “It just comes down to mistakes. We made a few mistakes tonight and it cost us at the wrong time. But like I told the kids, ‘Last week, great game offensively. This week, not a great game offensively.’ But it doesn’t matter, every week we have to get better.” The Senators held the Trojans to just 57 yards of total offense, unofficially. The game would remain scoreless as the Trojans nor the Senators were able to capitalize on late drives just before the end of the half. 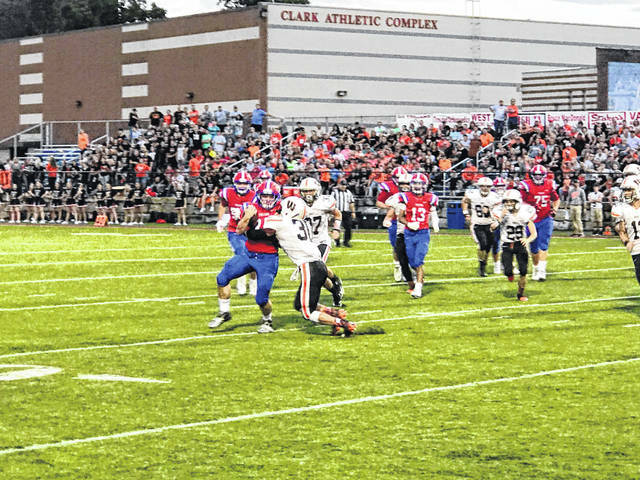 The first score of the game would come late in the third quarter as Senator senior running back Garrett Hurd rushed in for a four yard touchdown rush with 3:16 left in the third quarter giving West the 7-0 lead after the made XP by Luke Howard. West’s next score would come near the middle of the fourth quarter after a Josh Berry 30 yard touchdown rush sealed the deal, giving the Senators their second straight road victory to open the 2018 regular season. The Portsmouth Trojans will travel to River Valley next Friday night to face the Raiders with kickoff set for 7:30 p.m. in Bidwell. The Portsmouth West Senators will open their home slate of games next Friday against the reigning OVC champs, the Coal Grove Hornets. Kickoff for that game is set for 7:00 p.m.